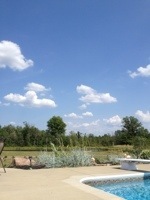 A breezy 90 degrees by the pool watching our crops thirst. Not a chemtrail in sight! Chance rain tomorrow.